Today – a self indulgent detour from my December/January travels to 1) celebrate my debut as a published travel writer and 2) the first response to my blog which both happened yesterday, popping up on my iphone as I was sitting in the gallery of the Washington State House of Representatives watching them pass a budget. It was thrilling (the budget was also a good one, but I digress….). I wrote two chapters of another co-authored book that was the product of a summer Fulbright Scholar trip to Peru – a book so obscure it can no longer be found. And I was once quoted on the glossy fliers for Slickrock Adventures after a trip I took with them to Belize. I’m also an inveterate Facebook poster during my travels with a small band of readers who regularly respond. But yesterday I became official – a solo article in Travel Post Monthly and my first blog commenter, elizzabizzy. The travel article is posted below. Click and scroll down past the archive of current/prior editions to find the contents of the current edition. You’ll read about Carnaval Negros de Blancos in Pasto, Colombia, the last stop on my trip. And because you might be interested in what happened before the exuberance of Carnaval…coming up next – Lake Atitlan, Guatemala and Medellin, Colombia. There are two Black Cat accomodations in Antigua – the Black Cat Hostel that promises a happy hour in the bar every night and a hangover breakfast in the AM and it’s little sister around the corner, the slightly more expensive Black Cat Inn, that promises an upper terrace breakfast and private or semi private rooms. I went for comfort as the rendevous point to meet my peregrine offspring, Zach, who was flying in the day I arrived by van. It was a great choice. 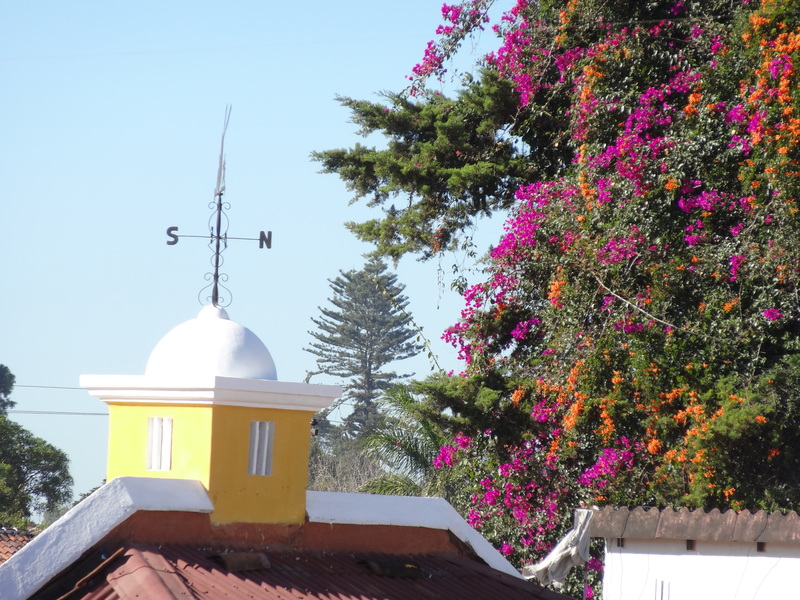 The rooftop terrace was surrounded by the vibrant colors of flowers and painted buildings. The wifi signal was strong and the cups of Guatemalan coffee never-ending. Antigua is surrounded by three volcanoes, visible from most parts of the town, that have erupted or shown activity in the last centuries. In 1717 and again in 1773, earthquakes destroyed the city. The last major volcanic activity was in September, 2012. The town turned out to be an excellent hub for exploring the country. 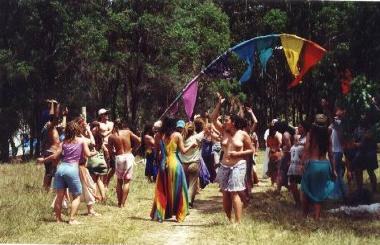 Tourist agencies offering cheap travel and/or hostels and adventure packages are ubiquitous. I was raised Catholic. Midwest, small town Catholic. Serious-old school-steeped-in- tradition-Latin Mass-Catholic. I’m a fallen Catholic for many reasons, but among them was that I’m not solemn or reverent enough. And so it was that I found myself in one of the world’s most Catholic countries during that part of the Catholic world’s most important December religious festivals – the Festival of the Virgin of Guadalupe (also known as the Virgin Mary and the Patroness of Mexico). My first clue should have been the flight from Los Angeles to Mexico City the week prior. It was filled with pilgrims traveling to the Basilica of Guadalupe in Mexico City – the most visited Catholic shrine in the world, drawing over 6 million visitors during the weekend of the festival. I trudged from the bus station to my budget San Cristobal hotel (found online in the bus station at three times the normal price) while fireworks blasted all around me. On the ground. In the air. Accompanied by the peal of churchbells. It was all part of the festival. As were the decorated vehicles with Virgin images and carnaval of music and rides. This was no staid holy day of obligation and quiet contemplation Catholicism. In parts of Mexico where indigenous cultural beliefs (in this case Mayan) have melded with traditional religion, the celebrations are a rich mix of both practices. Yes, there were churches and masses and incense, but there was also noisy, messy, joyous celebration. The following day I joined the carnival throngs of Mayan families from the villages surrounding San Cristobal. Women wore colorful ribbons, beautifully brocaded capes and black fur skirts to distinguish their village origin. Three days of fireworks and carnaval were enough and another do-over was done. It was time to embark on the remainder of the trip. There would be no more nostalgic jaunts down memory lane from this point onward because it was all new territory. A twelve hour van trip to Antigua, Guatemala that included two van transfers and a border crossing: a do-first. Having ecaped the combination of religious fervor and gathering Rainbow Family festivities in Palenque, I caught the bus to San Cristobal de las Casas for yet another do-over. In my memory, it was a charming mountain town steeped in colonial architecture surrounded by smaller Mayan villages. It was there, 28 years earlier, that I met the subject of one of my college research papers – Gertrude Blom. 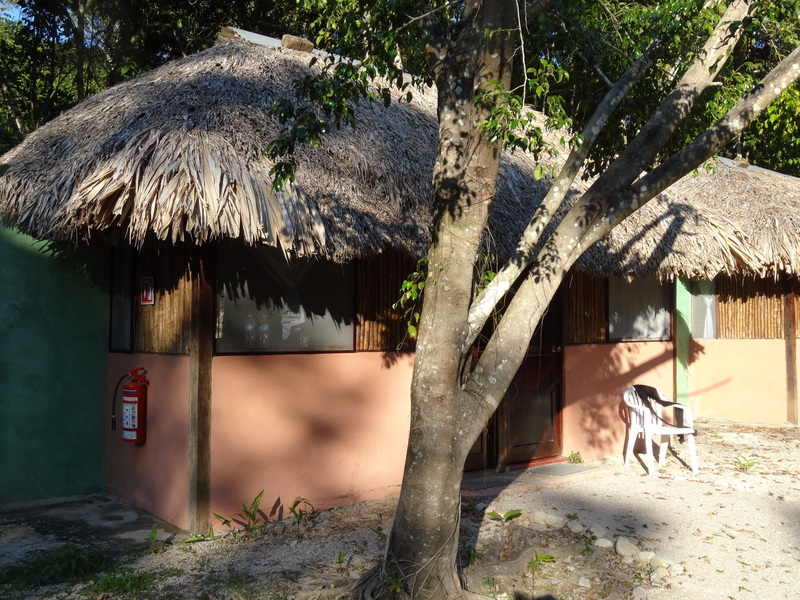 On my previous trip, I had stayed at Casa Na Bolom, the home, hotel and research center of Frans and Gertrude Blom, internationally reknowned archeologists, photographers and environmentalists. Frans had passed away, but Trudi Blom still lived at Na Bolom and each night at dinner she presided over a long wooden table lined with an array of guests. 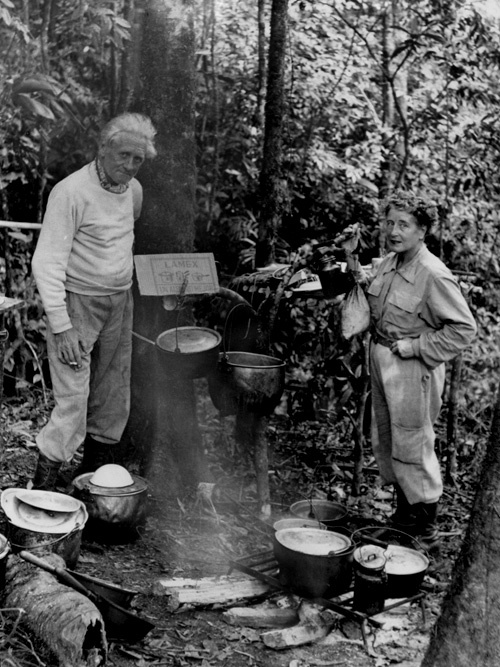 The Bloms were particularly concerned about the plight of the Lacandon Maya, a Mayan group whose numbers had been impacted by the diseases incurred by contact with the Spanish and white populations. When members of the group came into San Cristobal from their jungle homes, they were always given free room and board at Casa Na Bolom. My most memorable dinner companions one evening 28 years ago had been the leader of the Lacandons’, his wife and three of his children and two nuns from the United States – one a Mother Superior trying to decide if she should leave the convent to marry a man she loved. Also Gertrude Blom. She had passed away since my stay there and I knew that in 2011, she and Frans had been reburied in a traditional Lacandon ceremony and village. Bolom is Mayan for jaguar and Frans Blom had been one of the first archaeologists to discover and excavate Palenque. Those karmic connections to my Palenque do-over were not enough to get me accommodations at Na Bolom on this trip. It had been booked up for months. I arrived in town sans reservations at the height of the second biggest Festival of the Virgin of Guadalupe in all of Mexico. ….as my grandmother used to say. The do-over is done, the 30 year itch was scratched and Palenque is no longer shrouded in the romanticized mists of my memory. From the beginning it didn’t unfold as it did back in the day. Getting there took longer. The local airport had closed and I couldn’t just get off the plane. The journey this time required a plane to Mexico City, plane to Villahermosa, bus ride to Palenque and microbus ride to the ruins. Palenque, the town is about 10 minutes by microbus from the entrance to Palenque, the national park and both are in a jungle. According to my bus driver, the tourist infrastructure had been vastly improved since my aborted trip, a good thing since the town was filling with Europeans and Americans arriving for a month long party. Undeterred, my rolling suitcase, day pack and I found a one room, rustic cabana inside the national park in order to recreate what I assumed would have been the accommodation situation had I gotten off the plane 30 years ago. Jungles at night are noisy places. Nocturnal creatures are active. All sound is amplified. And it’s pitch black. Sometime during my first night I was awakened by the loud grunting and growling of a jaguar outside my flimsy cabana window. Unsure of how to protect against a fierce omnivore (I’d seen the Life of Pi before leaving on the trip), I pulled the blanket over my head, huddled under it with my I-Phone that had no signal and stayed vigilantly awake the rest of the night. The next morning I asked the owner about the prowling jaguar and he said the noise was monkeys. To be precise, it was a band of howler monkeys whose repertoire of sounds includes the growls of large felines. They were everywhere in Palenque ruins while jaguars had not been seen for years. 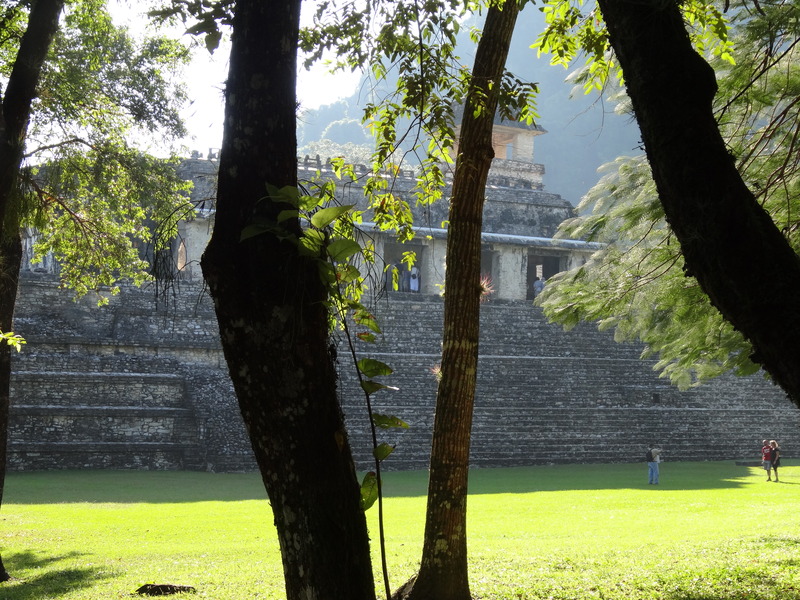 During my four days in Palenque there was the influx of celebrants for the Rainbow Family Gathering spilling out of public buses loaded down with camping gear, musical instruments and the crumpled look of a 24 hour bus ride. I had expected their arrival. But it turned out Palenque was also in the first days of its annual celebration of the Virgin of Guadalupe, an event that includes teams of relay runners jogging the highways and streets of the town carrying a picture of the Virgin followed by decorated team relay vehicles. The combination of religious fervor and “migrating, alien nomad” fever was was undoing my contemplative do-over. I decided to replicate another trip taken back in the day and bought a bus ticket to San Cristobal de las Casas. Three factors are driving the planning for my next trip. I have some time off from work in December/January. There’s a particularly intriguing early January festival in a town in southern Colombia that I’m determined to see. I want a do-over. ????????. I’m a migrating, alienated nomad? No turning back now. You don’t undo a do-over. I am, at various times of the year, a 60-something peregrine woman. I love to travel, some of it to off-beat locales all over the world. I crave it. It doesn’t take long for the wanderlust bug to hit once I’m over the jet lag of a trip. I blame it on my parent’s subscription to National Geographic Magazine that brought the exotic world to our mailbox every month. On the other hand, I also need a nest – my home in my charming northwestern US town complete with a firm mattress that supports my back and the familiarity of rituals, including a superb cup of coffee first thing in the morning, a membership to the local community theatre and a tiny yard that requires weekly mowing. I suspect the tug-of-war between migratory wandering and flying to the comforts of home are more typical than not. Yes, I follow the blogs of intrepid travelers who sold everything to backpack around the world for an indeterminate length of time. Most of them are under 30. Or traveling as couples. Or living as permanent expats. They aren’t my story. I’m a single parent and have been for the duration of my son’s 27 years. I recently retired but still do some part-time consulting which can’t be done remotely. I live on a modest income. There’s also the the issue of the aforementioned call of the nest. But when I travel…..oh baby, do I travel! I’m not afraid to travel alone and do a lot. I also travel with friends or family if our planets align. I seek out unusual destinations – Colombia, Nepal, Romania, Morocco, Mongolia, Bosnia and Herzegovina and Zimbabwe. On the other hand, I adore Paris and could languish for weeks in Madrid or Rovinj, Croatia. My friends and colleagues regularly tell me that I’m “brave” or “adventurous”. I’m not. I’m curious and resourceful and my bucket list that began with dog-eared copies of National Geographic when I was young, gets longer the more I travel. Peregrine Woman was created at the urging of my community of actual and virtual friends who follow my travels on my Facebook page and still have questions about how I go about my peregrine life as a 60-something woman. How do I decide where I’m traveling? How do I prepare for a trip? How do I navigate wandering solo? How do I do it and not get mugged or grow lonely (those seem to be the two biggest fears, right?) How do I travel differently when not traveling solo? How do I travel inexpensively? How? Here’s how……………..